The heart of The Storm Cellar is the historic Redstone Vineyard, within the West Elks AVA. Originally an apple orchard, the property was subsequently planted with vinifera grapes in the late 1980s, the dream of former owners, Doug and Sue Phillips of Plum Creek Winery. Many of these original, ungrafted Old Wente Clone Chardonnay vines still thrive here and form the backbone of our ever-expanding Chardonnay cuvée. At 5,880 feet above sea level, this vineyard is simultaneously a vineyard manager’s nightmare and a sommelier’s dream. A unique set of circumstances, while each challenging to manage, contributes to the complexity of our wines. Similar to the soils in Champagne, Burgundy, or Santorini, our white, chalky soils are extremely high in pH and riddled with ancient river rock. This soil type, along with an arid climate, alpine desert conditions, and intense sunlight, provides a superb concentration of fruit, laser-sharp acidity, and bold aromatics. While challenging to create, world-class wines are often crafted within harsh environments. We will continue to uncover and celebrate the distinct attributes of this vineyard, while navigating the dramatic swings of vintage variation common in our extreme microclimate. The North Fork Valley is lined with a series of mesas along its western edge, each of which has a unique orientation and microclimate. Doug Phillips, who originally sought out this property, did extensive research on each of the mesas here and found that Sunshine Mesa was particularly suited to growing grapevines. The Redstone Vineyard enjoys perfect southeastern exposure, with slopes in the vineyard ranging from a 5 to 12% grade. This slope, combined with our elevated situation 500 feet above the valley floor, means that we regularly have a 3 to 5 degree warmer temperature than the valley floor, giving us a greater chance at avoiding frost damage in our marginal climate. We do have two large wind machines in the heart of the vineyard which also help us moderate the weather on particularly cold days. Regarding water, the most crucial commodity within a desert climate, the Redstone Vineyard has two distinctly different sources. Our primary source of irrigation, which is mandatory in this high desert climate, is the Fire Mountain Canal. This canal funnels water down from high elevation snowmelt to the Paonia Reservoir and then flows through 35 miles of the North Fork Valley. Much of the Paonia Dam, which holds back the reservoir, was constructed from rocks sourced from the southwest corner of our vineyard around 1960, while this property was still an apple orchard. Our second source of water is a crystal clear mountain spring which provides our drinking water and supplements our vineyard and winery needs. Most of the valley floor enjoys rich, alluvial soil, but here on the mesa, our situation is much different. Our topsoil ranges from just six inches to around two feet, underneath which lies a dense layer of caliche. This particular soil is derived from the ancient waters that used to cover this entire region. It is an extremely hard, dense layer of calcium carbonate that binds together other soils and rocks much like cement. This soil is very well drained and high in nutrients such as calcium, magnesium, and potassium. Our property lies in the heart of the North Fork Valley, which takes its name from the section of the Gunnison River that flows through the region, on Colorado’s western slope. The unique climate here is moderated similarly to areas in California like the Petaluma Gap in Sonoma. The valley acts as a funnel for air and while areas in California bring in cool air from the ocean, the North Fork Valley brings in warm air from the deserts west of us, allowing for the growing of vinifera grapes at this extremely high altitude. The extreme elevation provides intense UV exposure, but the marginal climate only allows for an average 100 day growing season. It is a unique, fertile “banana belt”, home to an abundance of organic fruit and vegetable farms. The West Elks AVA, established in 2001, is one of two officially designated grape-growing regions in Colorado. 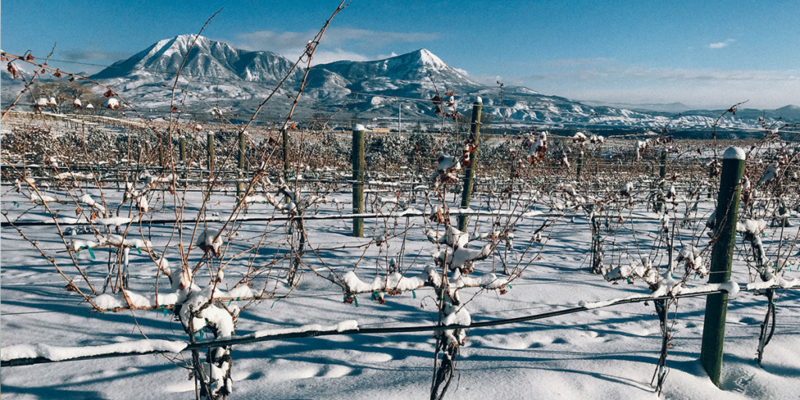 Located in Delta County on Colorado’s western slope, it boasts the highest altitude commercial vineyards in the northern hemisphere, ranging from 5,400 to 6,400 feet above sea level. The Redstone Vineyard was originally planted with 23 acres of own-rooted Old Wente Clone Chardonnay in 1987. Since then, many of those original vines have been replaced and replanted with other varieties for the sake of diversification, but nearly five acres of those original Chardonnay vines remain. Currently the vineyard is planted with five acres of Chardonnay, six acres of Riesling, three acres of Pinot Gris, and an acre of Sauvignon Blanc, all of which are own-rooted. Although many believed that the extreme nature of our soil and climate would keep these own-rooted vines safe from phylloxera, unfortunately, that was not the case. There is an approximately two-acre section of our vineyard that is infected with the root-destroying louse, and it is moving, albeit very slowly, throughout the vines. While we will nurture these susceptible vines as long as possible, but it has prompted our replanting of the vineyard. In May of 2018, we planted 1,000 grafted, Rued Clone Chardonnay vines on cold hardy 5C rootstock. They were the first new vines planted in this vineyard in over a decade, and they were the first grafted vines planted here in the West Elks AVA. We have 1,000 grafted, Dijon Clone 95 Chardonnay vines arriving this spring, and we have plans to add 1,000 new vines every spring going forward, eventually filling all 23 potential acres here on the property. We began the rehabilitation, revitalization, and replanting of the Redstone Vineyard, as soon as we purchased the property in early 2017, and the progress continues. Fencing, irrigation, and trellising repairs have all been an integral part of vineyard life. Through thorough research and ongoing dialog, we are implementing effective and sustainable pruning, training, nutrient, and water management practices. The vineyard had been conventionally farmed up to the date of our purchase; however, we are transitioning to sustainable and organic practices. We make as few passes through our vineyard as possible, not only to reduce our footprint but also to slow down the spread of phylloxera. We use foliar nutrient sprays since the phylloxera slows down the uptake of nutrients through the roots. The high pH of the soil makes iron absorption difficult for the vines, so we have to use organic amendments to compensate. Almost all of the weed control is managed by hand-weeding with a small “push-weeder”, once again to moderate the movement of phylloxera.